Feedback revealed a greater desire for environmentally sustainable developments. Σ That a town planning sustainability policy be developed together with ESD objectives in the MSS. Σ Investigate possible incentives encouraging ESD for developments. Σ Develop a Water Sensitive Urban Design Policy. Σ Continue advocacy for a Statewide ESD Policy. Even the WSUD idea morphed into the single issue of the Elster Creek Catchment project rather than seeing this as an issue for each individual development application. For 30 other Victorian Councils, waiting around is not an option. Here’s a recent announcement from the MAV – the peak body of all councils. Glen Eira isn’t even a member of the above listed alliance! Why not? Why is this council so averse to working collaboratively with other councils to ensure positive outcomes for the community? Is it really so hard to devise a policy that is now firmly entrenched in countless other planning schemes? Or is it that any impediment to developers goes against the grain? Here is a list, taken from the CASBE website of all councils forming this alliance. Glen Eira City Council likes to compare itself to its 5 neighboring councils. 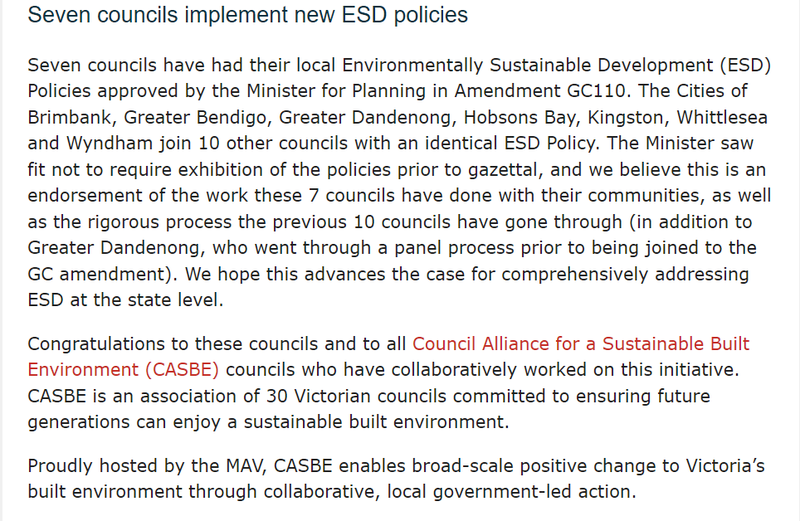 Well…Bayside, Kingston, Monash, Port Phillip, and Stonnington are listed as members of CASBE, yet Glen Eira isn’t. Or disagree With CASBE’s methods: “lead…collaborate…take action…advocate…educate…engage”. Hell of a lot easier to put out mealy mouthed statements about giving a stuff rather than maybe doing something. Cheaper to. Developers must luv Glen Eira. Joining groups means coming under scrutiny, this is one thing Glen Eira bureaucrats avoids at all costs. Secrecy is paramount, what have they got to hide? Glen Eira is island surrounded by Councils committed not only to the ESD cause but many other fundamental planning policies and practices. A large part of the problem is our 9 councillors have no idea of what is going on out there in the real world. They get there propaganda briefing from the bureaucrats that keeps them in their comfortable ignorance. None of them show any interest in going anywhere beyond this envelope. How times has Hyams and Magee rose to their feet at council meeting and passionately raved on about how great and innovative Glen Eira is. So long as we have little men like these two veterans of self interest as councillors we are doomed to substandard levels local government. It’s so much more easier for our councillors to believe the web of fantasy spun for them, than to actually do their jobs.